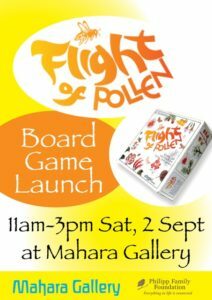 The environmental board game Flight of Pollen launched at the Mahara Gallery on Saturday 2 September. 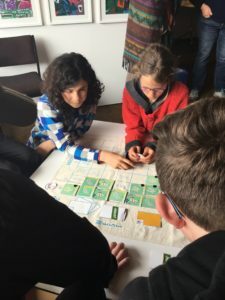 Designer JiL Hemming (Otaki), illustrator Cushla McGaughey (Waikanae), and graphic designer Don Little (ex-Waikanae), were joined by players from Kapanui School to show-case the new game. 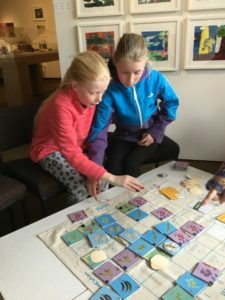 “It takes a village to make a game,” said JiL as she thanked Janet Bayly (director Mahara Gallery), plus pledgers, supporters, game-testers, and many others for their generosity and expertise. Money toward printing costs was raised via the PledgeMe campaign plus with a generous grant from the Philipp Family Foundation. 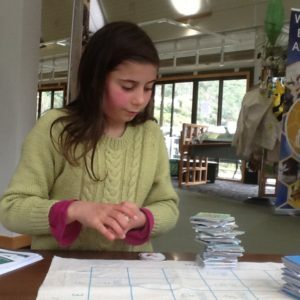 The how-to-play videos, made by Kapanui School students, were also launched. Saturday 2 September. 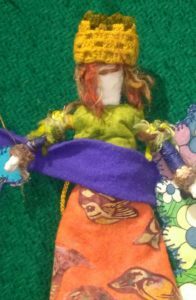 Mahara Gallery, Waikanae. 11am – 3pm. Entry free. Teams of players will demonstrate and/or teach the game. And the how-to-play video, made by Kapanui School students, will have its first showing. Pop in anytime, if you can. Printing is on with the generous support of the Philipp Family Foundation. We have got there, but by another route! Many of you have let me know that your pledge still stands. Thankyou. We are still in need of these. 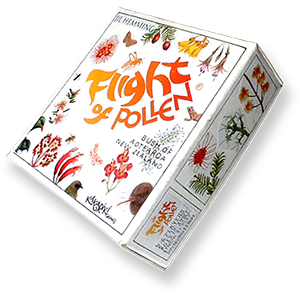 We’re going to have a board game played in our bush, by day and by night, with our pollinators. Magic! WEEK 3. Pledgers 29. Pledged $2,317. 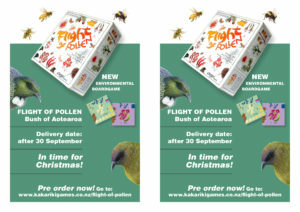 Target to print Flight of Pollen $$26,250. Days left 16. Shares on Facebook 55.